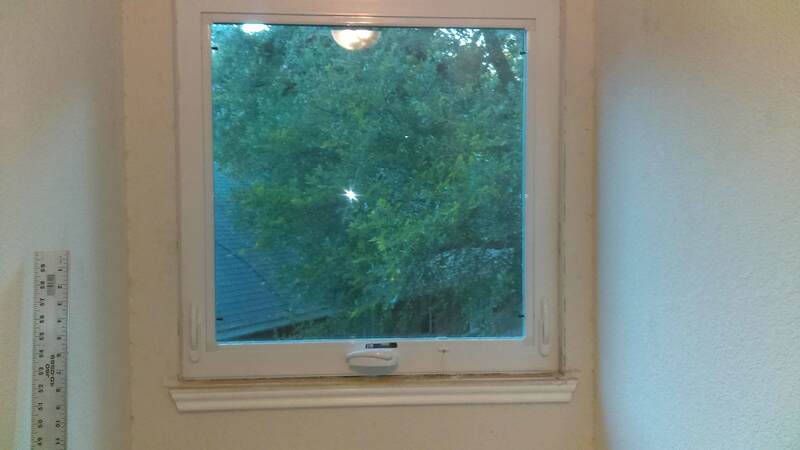 Here in central Texas, I have decided to install windows from my local window manufacturer that has 5* ratings. I am going to be doing my own install with hired muscle as needed prior to having siding replaced w/ Hardie. We also have brick. For the ones going into siding, I measured the rough opening the existing window is sitting in. They seemed easy to measure. Should I anticipate any issues installing a 60x60.25 slider into a 60x60.25 rough opening? I plan to cut back the sheetrock as the window is going to be about an inch deeper. I currently have very thin masonite siding with a similar trim. 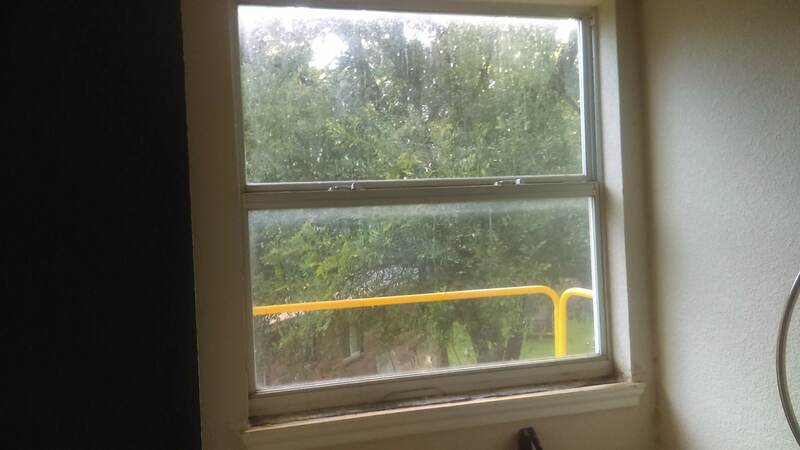 What method should I use to remove the old window, install the new and then seal it up until the siding company comes. I assume the siding company is going to have to redo some of my work to tie in the siding and install new Hardie trim. The siding company will be installing housewrap under the siding. We have a window in the master bath with a marble sill over the tub. It seems like this one would be pain to cut back and difficult to color match. Should I just do an inside measure on this one? It is a 4040 slider. For the brick, the measuring was much more difficult as the width varied greatly up and down each window. 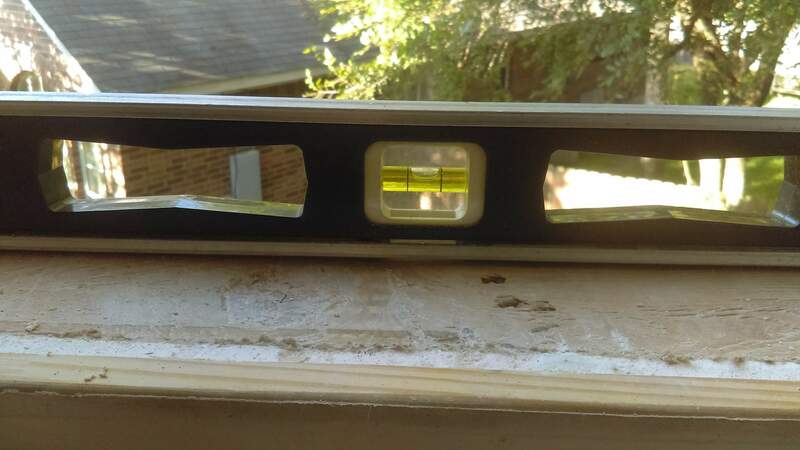 I found the thinnest location and measured it for the width and height on each window. Is that the size to order, or should I go even smaller? 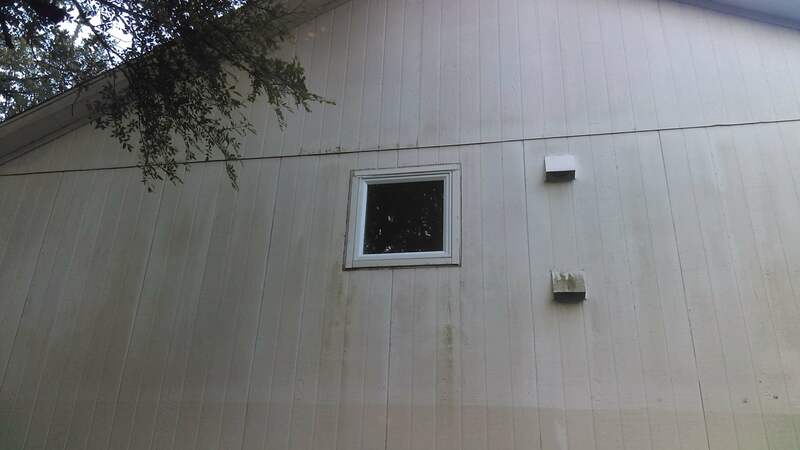 The manufacturer says to remove the old window and place the new one in from the outside up to the old sheetrock so it will stick out the extra inch or so into the brick. Stuff the cavity with fiberglass, and then add adjustable snap-in trim if needed, backer rod and caulk. They don't recommend or use minimally expansive foam. The make size of the window will need to be smaller than the rough opening. You are going to need squaring room to account for framing not being 100% level, plumb, and square, plus shims and insulation. I like in new construction a 1/2"
gap in new construction around the window to the rough opening. You're going to need to deduct off of the brick a little as well. Pulling up the marble sill and ripping with a wet saw might be an option if not too involved with the removal. Should I anticipate any issues installing a 60x60.25 slider into a 60x60.25 rough opening? Yes. 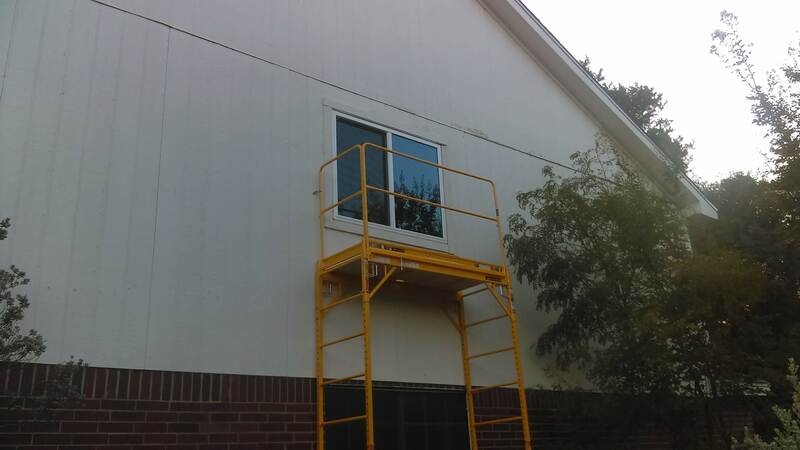 The mere question suggests that you may want to seriously consider having the siding guys install these for you. This isn't a cookie cutter install. If I were the siders I'd demand it or run from the job because your installs will probably leak, and you will be calling them to complain about it. I didn't mention it on this thread, but we actually had signed a bid for the siding company to install windows and siding but they backed out of the window install. This was due to ordering issues from the manufacturer they were using. They came back with quotes from Simonton but I didn't like them. The siding company actually sent out their measuring crew and this is the measurement they came up with that I confirmed. The existing windows are 60x60.25 and the rough opening is the same. The builder from 20 years ago used no insulation, just tar paper under the window and siding going over the nailing fins. We have never had any issues with water coming in. 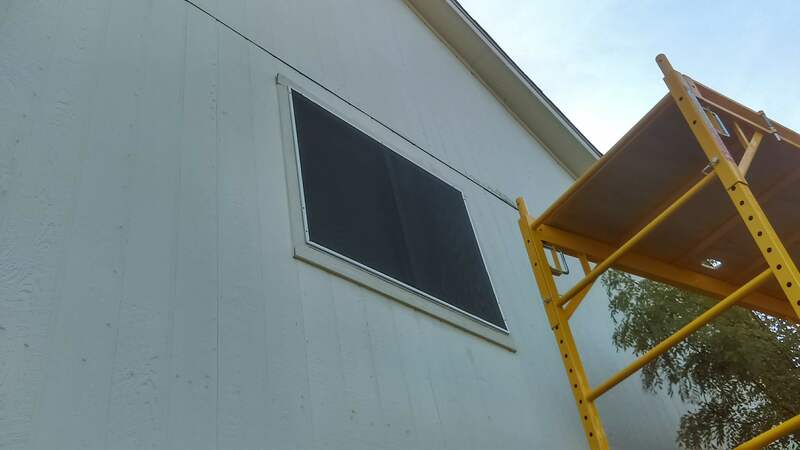 I ordered my first two windows today from a local manufacturer. They had the best combination of price and performance and customization, plus having them nearby should help with support. One will be a 5040 slider with LoE-340 for the game room and the other a 3030 awning window with LoE-366 for the top of the stairs - wanted good ventilation (replacing single-hung that is impossible for wife to open), both with nail fins. I am going to do these before ordering more (or bigger) windows. I took the temperature of the frame on the old aluminum frames today. On the SW side they were 114F with a solar screen. On the shady north side the frame was 98F. Temps outside were 103F at the time with the AC inside at 78F. The new awning window will have a u-value of .26, SHGC of .19 and be DP50. The slider will be u-value of .29 and SHGC of .15, DP-35 and VT of .31 - about 3 times brighter than the old window w/ the solar screen. Hoping to see improvements. Last edited by LoneStarGuy on Sat Aug 18, 2018 11:42 pm, edited 1 time in total. So I took out the first window and installed the 3030 awning. The builder did not use house wrap, but instead had tar paper and siding going over the old aluminum's nail fins. The sill was perfectly level. There was NO insulation at all as expected. Also, no z-flashing above the window. The siding and tar paper just came down over the nail fin. Surprisingly the only water damage was due to condensation on the sheet rock returns which was minor. I discovered my opening was a bit wider/taller than thought as they had used a fiberboard as a full length shim behind the sheet rock and up against the jam. The rough opening was about 3/8 inch larger than the ordered window in both directions. 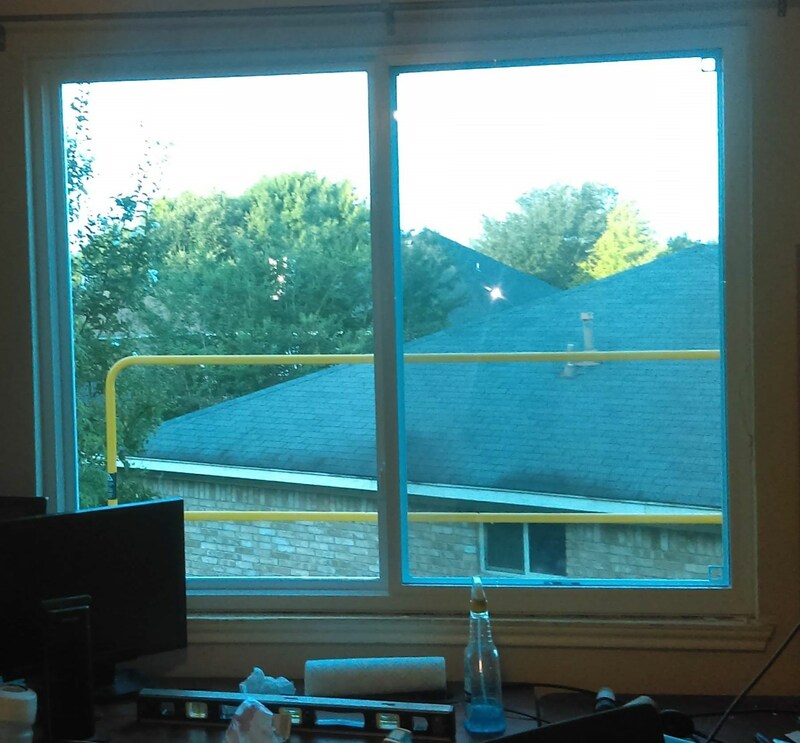 The manufacturer said to have the sill support to weight of the window. I added ProtectoWrap on the sill and 6 inches up the jams and set the window on that. With the sheetrock cut back 1.25 inches and the recommended fiberglass insulation stapled to he header/jams per the manufacturer the window sits in square, plumb and level. I finished he install tonight by using QuadMax OSI sealant and #8, two-inch pan head screws. The QuadMax was not very easy to work with but the install seemed to have gone well - better than expected for our first install. Still left to do is adding trim and caulk. I assume adding z-flashing makes sense - not sure why the builder didn't use it.....? We will get house wrap installed in few weeks w/ the siding replacement. The next ones should go faster. I bought a better saw for cutting back the siding / trim plus got more experience. This first one took hours - it was quite a workout. Not going to the gym this week. Last edited by LoneStarGuy on Sat Aug 18, 2018 7:36 am, edited 1 time in total. Its weird when you start using very job and task specific muscles. You'll be sore in spots that you didn't think you should be. Sounds great. Post up some pics and we will look forward to the updates. So got window #2 installed. Just need to trim the outside and caulk against the sheetrock. This was a bigger 5040 slider. The high today was 104F. I measured the temp of the inside of the old aluminum frame at 119F when it was in the sun. The biggest difficulty today was the sheetrock cutback. The larger opening made our lines not so straight and we cut it back a bit too much, plus the drywall nails happened to line up perfectly with where we were cutting so there is not much holding the remaining return in place. Lesson learned, this is why the caulk/walk guys don't cut sheetrock...... Even if we had a perfect tool, the line the nails would still have made a mess. We found some siding and trim rot where again no z-flashing was used. We ran into a mostly level sill, not sure how level is level enough.... The bubble was almost centered (bubble just slightly out of center but within the lines). With our 4 foot level the shim we would need to perfect it would be about about 1-2mm. Perhaps a mistake, but we decide to skip the shim. Round 2 is going to be ordered next week and should take 2-3 weeks to come in. Wondering what tools to get. We will be installing two 5050 sliders, a 4040 tempered slider plus either a 6050 slider or mulled 3050 twin single-hungs. I think we need to get something to help carry them and something better for the sheetrock cutback. The trim saw cut the siding like butter, saved a lot of time. The siding/trim will be getting replaced w/ Hardie in a few weeks as the siding is in bad shape. Got one more question. I installed the next 4 windows, all big horizontal sliders. 2 went into siding and 2 into brick. I had been an easy to work with and cheap DAP indoor/outdoor caulk against the trim and siding as the siding is going to be replaced soon. For the brick, I purchased white GE 100% silicone. The caulk line is embarrassingly bad. I think I want to remove it (i put it down on just the bottom and side of one window). What is best to use instead? I've been using OSI Quadmax as my sealant behind the nail fins in siding, which seems to be highly regarded here but it seems like it would be hard to tool. It was reallly runny in August but better tonight when it was around 80F. The guy at Home Depot recommended DAP Dynaflex 230. Any thoughts on if that is a good easy to work with product or is their some thing I might be missing about the 100% silicone or the Quadmax. Regular Quad is really good too. I am not a fan of the full silicone caulking. Its a PITB should you need to remove or go over it in the future. I like regular quad, sometimes I Also use vulkem when going up against stucco or brick and I match it to the stucco or brick and brick mortar color. I have also tuck pointed mortar between brick and trim, brick t all depends on the situation. Do not like latex caulks or silicone unless it is a small bead and going aluminum to aluminum or vinyl. I feel it is best not to tool regular quad or vulkem. It helps if you have a nice caulk gun like an Albion B26 . I wanted to give every one an update. We installed our second round of windows made by our local company, and finally got our Milgard window delivered -- took 6+ weeks to get one little 12x60 single-hung. We had a issues with it breaking on its way to Home Depot, having the wrong parts ordered to fix it, them losing it, etc. We plan to install it this weekend if it ever stops raining. We've gotten close to 15 inches of rain in the last 3 weeks and areas near us have had bad flooding. A big cold front blew in on Sunday night to give us our first cool weather. Sunday had a heat index of 100F and the high on Monday was around 47F. The front brought a lot of wind and heavy rain. We had one tablespoon of water on bottom-right corner of the fixed sash next to the meeting rail of our large 72x60 slider. My wife noticed the top of the window was not fully closed, so she opened it and closed it pushing in the center and secured the locks again and no problems since. I saw a similar issue on another window where we again closed it again after adjusting the weather stripping and firmly closing it and saw no more leaks. With temps staying in the 40's to upper 50's these last 5 day, the temp inside is now 71F, having never gotten down below 67F even with the heat off. We only replaced 9 out of 17 windows so far and expect even more improvements as we do more. We are impressed so far with the extra comfort and quiet. We still have 8 aluminum windows to replace and those rooms are quite different - on the morning of the front, their frames were dripping lots of condensation where the vinyl only had a little bit on the glass in the master bath after a hot shower was taken. As for air leaks, I notice some cool air coming through the drain holes on the track of the new sliders when the wind was really blowing but i noticed more air coming through from electric outlets, light switches, etc. Air sealing and insulation will help any home with air leaks. Think of the home as a big chimney when it moves air out, air must come in to replace it. I noticed the siding installers left no gap or less than a 1/8 inch gap between the Hardie trim and the vinyl window frames. They have not yet caulked or painted. Both window manufacturers recommend a 1/8-1/4 inch gap with backer rod and caulk between the window and trim? I let the lady at the siding company know about this concern and she is looking into it. Is this an issue I should worry about?